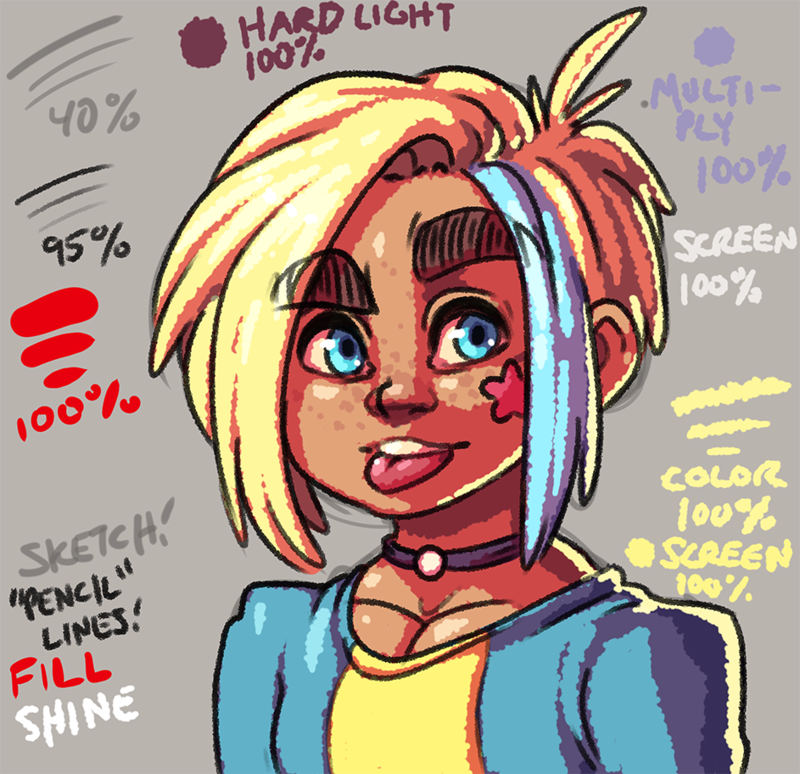 Check out this quick digital art tutorial with this doodle yeah! This is a quick run through of my usual techniques that I try to squeeze the best looking image out of the shortest time possible with as little effort as possible because I just want to do a lot of drawings and not focus on one for too long. Okay so first I'm using Clip Studio which is an amazing piece of software that sometimes you can totally grab for just $20 when it's on sale. I'm drawing on a Wacom Cintiq 22HD. Okay! I start with a 30 pixel brush at 100 opacity with a hardness of 60, and a brush density of 80. 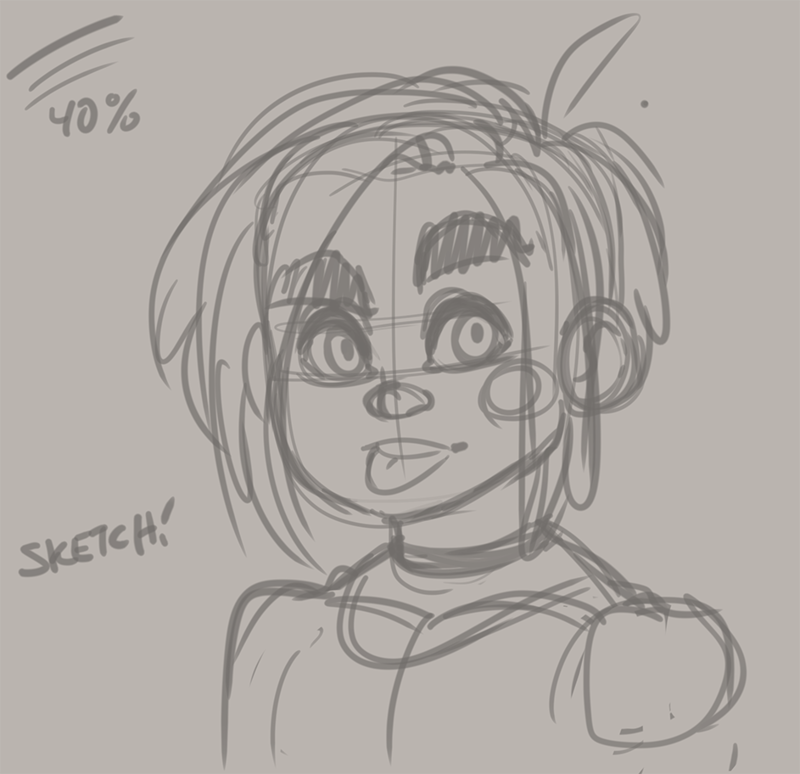 I make a rough sketch on a layer of 40% opacity. I also usually make the canvas some sort of dull color instead of pure white since I find it way easier to draw, and color on a darker canvas. Also I usually work at double the resolution I plan to export the image as, so all of these images as examples are actually scaled down 50%! On top of the sketch layer I drop a new layer for the line work. I use a brush that has particles to make it seem like a pencil on paper. With a brush size of 20, hardness 60, particle size 9, particle density 6, and spray deviation of 50 I draw over the sketch on a layer set to 95% opacity. State Machines are the greatest thing I've ever discovered when it comes to programming games. More and more I'm beginning to realize that a lot of the structure of the tools I've used is in fact a state machine! To find out exactly what a state machine is, check out this wikipedia article which describes them as "...an abstract machine that can be in one of a finite number of states. The machine is in only one state at a time; the state it is in at any given time is called the current state. It can change from one state to another when initiated by a triggering event or condition; this is called a transition. A particular FSM is defined by a list of its states, and the triggering condition for each transition." An example of this in action in my games are the guards in Super Ninja Slash. They have a couple of different states. Idle, Alarmed, Shooting, and Dead. That covers all their bases for their behavior. Without using a state machine, writing code for all of that behavior can quickly become a giant mess of if statements and booleans. With a state machine, I can completely separate all the code for the guard's Idle state, the Alarmed state, Shooting, and Dead. Over the past week I added some menus and options to my Global Game Jam game remake. I'm doing this super early on in the game's life because having some awesome polished menus makes it feel like a "real" game, which motivates me to work on it more. One of the first things I did for the game options was window scaling. The game natively runs at 320 x 240, so obviously players are going to want some various scaling options unless they really want to run it at 1x and barely see the game on their screens that are now probably 4000 pixels wide. The awesome thing about working in AIR is that it will automagically resize the game's window to the size of the flash stage, so all I have to do is set the stage width and the stage height and the window will resize to match. However, there are some funky issues that can arise. The flash stage has different scaling modes that you can use. There's EXACT_FIT, NO_BORDER, NO_SCALE, and SHOW_ALL. 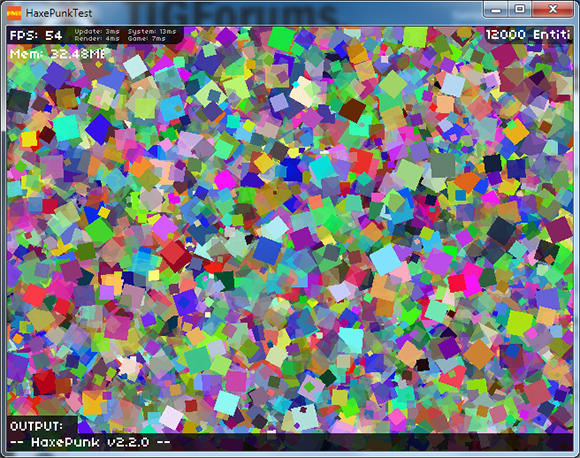 For the case of this game, I'm using EXACT_FIT after I resize the window. The reason for this is so that players with super huge monitor set ups can scale the window themselves.